Serious whitetail hunters live for this magical time of the year; the three weeks in November when something amazing can happen at any moment. Bucks can be on their feet at any hour of the day or night. Core areas and home ranges become meaningless as the mature males of the species pant and sweat and grind out the hours, searching for receptive females in a frantic effort to procreate during this short period of frenzied rutting activity. 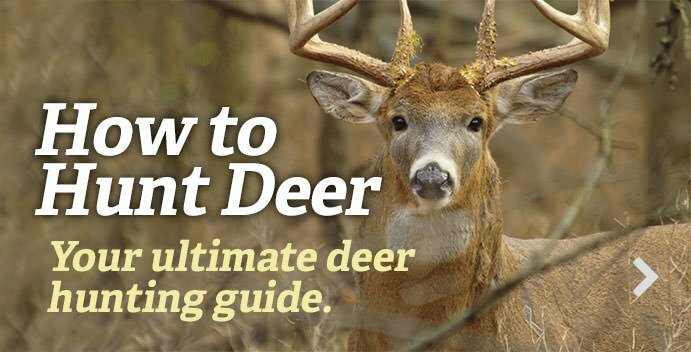 There is no better time to shoot the biggest buck of your life. You wait for the window of opportunity all year. Don’t spend it in the wrong spot. I hate that I spent so much of my life sitting in the wrong tree, but that is the nature of learning. Back in the 1970s growing up in Iowa, I had no idea the potential that I had available at my fingertips. While I lived in the wrong part of the state for consistently producing big bucks, the big bucks were within reach; only a couple hours’ drive away. But it took a long time to figure out how to put one of them in front of me. I would find a beaten-down trail or an area torn up with rubs and scrapes, and hang a stand. By the 1990s I was finally beginning to figure it out. I killed a couple really nice ones and today, I travel all around the Midwest looking for mature bucks every year, and that schedule requires me to be efficient — especially because I mostly hunt public land. Often, the obvious spots already have a stand and so much sign of human activity that I’ve learned to avoid them. Instead, before hunting any area, I spend some time looking over aerial photographs on Google Earth to find potential stand sites. Then, upon arrival, I look them over in person, taking note of the sign and the lay of the land. I want to know that when I put up a stand, it will be in a location where I can sit for a long period of time, and the only way a fidgety guy like me can do that is by having a supreme confidence in my spot. Particularly on those public areas and other lands that get a fair amount of hunting pressure, that spot is likely to be a site most other hunters won’t recognize. Here are three of my best-kept secrets. I killed a 6-year-old buck on public land in Iowa a couple years ago on the 12th day of my seven-day hunt. I found a lot of sign of deer activity on the outside of a large, sweeping river bend on the fifth day of the hunt. Once in a stand, I began to see deer movement including one nice shooter buck, but most of the movement was out of range, so I had to adjust a couple times. I moved my stand about 100 yards twice over the next few days before I settled on the exact spot where I killed that old warrior. The location was where the outside bend of a river swept up against a steep bluff, and it funneled the deer movement into a narrow corridor. This was a river that the deer could easily cross; in fact they can cross any river if they want to bad enough, but they much preferred to take the long way around, and a distinct trail had developed on a shelf along the steep bank. Deer, like all animals take the path of least resistance when traveling. They are looking for places where it is easy to walk, and so that’s where the trails develop. Any shelf along the riverbank from the top to the bottom of the steep bluff will have a distinct trail on it, and it will have the tracks of not only deer, but those of raccoons, coyotes, and all critters that roam the forest, because they all prefer to travel the easy route. This was a perfect place to intercept a buck that was pounding the pavement because it naturally channeled the deer movement into a narrow area, an area where I could easily cover with a treestand in the right spot. Once you find that perfect spot, you need a few things to help you put in the time to sit there. Confidence, comfort and safety are three key ingredients. Moultrie M-1100i: My philosophy on trail cameras is this: You need a few of them to get the full advantage. If you pay for junk, you probably won’t be happy. I’ve had the best luck with mid-price cameras, such as the Moultrie M-1100i that I’ve been using this season. It’s not exactly cheap at $230, but there are certainly pricier cameras out there. This one is easy to use and the performance is outstanding. Irish Setter Deer Tracker boots: I became a believer in Irish Setter boots after wearing a pair for 36 straight hours while stranded in the Denver airport (and that was after a week of hard spot-and-stalking for antelope). They would choke out a maggot by the time I took them off, but my feet never got sore. These new 10-inch Deer Trackers have 400 grams of insulation, which, when blended with a good pair of wool socks, is about perfect for a cool day in the woods. Hunter Safety System Patriot: Don’t get in a stand without a safety vest. Period. Brand doesn’t so much matter so long as it’s comfortable and reliable. Every HSS product I’ve tried is both. The Patriot is reversible between a camo side and a blaze orange side, and perfect for gun season. I lucked onto this type of location. I happened to see a buck emerge from the tip of a draw 100 yards away when I was sitting in a treestand in a bushy fencerow. I rattled at him, but after a short look towards me, he crossed the top of the hill and entered the point of a draw on the other side. After that morning’s hunt, I walked over there and was surprised to see a series of rubs and a small trail with several sets of big tracks. I realized that it was a perfect place for a buck to jump from one drainage to another with minimal exposure. He was only in the open for a very short period; it was an ideal shortcut. I don’t know of many people who hunt these places I came to identify as “jumpers,” but they can be absolutely dynamite if you find one in the right spot. These drainages may be referred to as hollows, ditches, draws or ravines depending on the local jargon. They are all checked by bucks cruising for receptive does. The place where an arm of the ravine reaches out into a field near an arm of the adjacent ravine will be used as a crossing point for bucks moving from one to the other. You have to burn the booth leather to find the good ones. Looking at an aerial photo will give you dozens of these to check out, and most will have little to no sign, but when you find the one the bucks really like to use, you will know it. Rubs, tracks and often a scrape or two will be the tip-off that you are in the right spot. The wind can be tricky in these locations; it tends to swirl and dance, and it will fool you often. Hunt these spots carefully and only with a light wind. One of my favorite places to hunt these is where the trail coming down the arm of the ravine intersects the main trail going down the middle of the ravine. This may be down the slope a distance, where usually the wind is friendlier. In keeping with the theme that bucks do not like to expose themselves in the open any more than is absolutely necessary, the corners of fields are another overlooked stand site. These are basic and simple locations, easy to identify on an aerial photo or a topographical map. Heck, you can even see them from the road many times. They are everywhere in farm country. We are talking about the square corner of an open field that has woods on at least two sides of it. Because they do not like to cross open areas in the daylight, bucks will travel around the point, keeping just inside the woods. This creates a pinch point of sorts that concentrates their travel patterns. These pinch points up your odds of being within range of a buck by funneling his activity into a small area. Bucks also use them when scent-checking the field; they will cruise around the downwind side of a field to smell what does and other bucks may be in the field. These places can have lots of sign or little to no sign, but it doesn’t seem to make much difference during the rut. For some reason, I have seen these areas all torn up with rubs and scrapes or, on the other end of the spectrum, maybe just a very faint trail. The amount of sign in these areas seems to have no relation to the amount of travel they get when the bucks get on their feet and begin cruising. I like to start monitoring these locations with trail cameras the end of October, which helps me learn which ones are getting the most use. I have found that if there is a lot of food in the area — like corn stubble or alfalfa in the field — it will hold more does and be more conducive to bucks moving around the field corners. Once the field is plowed up and the does are feeing and bedding elsewhere, the amount of travel around the corner may drop off considerably. Editor's Note: This was originally published on November 13, 2014.